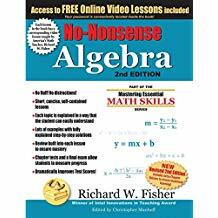 The new, improved edition of No-Nonsense Algebra. COMPLETELY EDITED, AND NOW CONTAINS EXTRA CHAPTER QUIZZES TO MAXIMIZE LEARNING. ONE EXTRA QUIZ FOR EACH CHAPTER. Includes free online video tutorials, taught by the author. One for each lesson in the text. Also, check out our new No-Nonsense Algebra Practice Workbook. The perfect companion to the text. The perfect way to ensure mastery of all Algebra topics. Includes a complete review of Pre-Algebra. Each lesson includes Problem Solving. Students will learn how to apply their knowledge to real-life-situations. The new, improved edition of No-Nonsense Algebra. COMPLETELY EDITED, AND NOW CONTAINS EXTRA CHAPTER QUIZZES TO MAXIMIZE LEARNING. ONE EXTRA QUIZ FOR EACH CHAPTER. Includes free online video tutorials, taught by the author. One for each lesson in the text. Lessons are presented in a format that everyone can easily understand. Also, check out our new No-Nonsense Algebra Practice Workbook. The perfect companion to the text. The perfect way to ensure mastery of all Algebra topics. Includes a complete review of Pre-Algebra. Each Lesson flows smoothly and logically to the next Each less on is short, concise, and to the point Lots of examples with step-by-step solutions Each lesson includes valuable Helpful Hints Review is built into each lesson. Students will retain what they have learned Each lesson includes Problem Solving. Students will learn how to apply their knowledge to real-life-situations.